The neural basis for poor cognitive outcome following traumatic brain injury. The neuroanatomical basis of consciousness is a topic of intense debate. Some experts support the view that consciousness depends on intact function of brain stem-thalamo-cortical arousal circuits while others propose that consciousness is instantiated in fronto-parietal association cortices. Our studies into consciousness/awareness do not treat consciousness as a function of these two mechanisms alone but instead as the functional integration of multiple independent neural systems, sensory and higher order, in response to internal/external stimuli. We use anaesthetic and sedative drugs with task and resting state fMRI to investigate the hierarchical organisation of cortical function. The results do not only inform our understanding of the neural correlates of altered states of consciousness but also enhance our knowledge of anaesthetic awareness. The figure shows changes in resting state connectivity following moderate sedation with propofol. Left inferior frontal contributions to semantic processing – insights from a study of sedation in healthy volunteers. Adapa R, Davis MH, Stamatakis EA, Absalom AR, Menon DK NeuroImage 2009;47:296. The neural basis for the common and disabling cognitive problems that account for poor quality of life in patients following traumatic brain injury remains uncertain. Conventional structural MRI or CT scans do not always account for these deficits, and many patients present with an apparent mismatch between their cognitive profile and the location of any structural lesions. We use fMRI to investigate the functional neuroanatomy underlying neurocognitive deficits following head injury, and the impact of novel drug therapies on these cognitive deficits. We carry out experiments with both healthy controls, to establish neuronal systems engaged as a result of normal cognitive function, and patients, to explore issues of reorganization of function. We use methods that are widely available such as traditional subtractive fMRI designs but also use innovative methods such as functional and anatomical connectivity analysis to establish whole network interactions in the context of specific task demands. 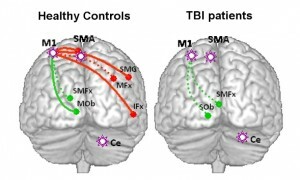 The figure to the right shows connectivity from primary motor cortex in controls and TBI patients. Cognitive sequelae of head injury: involvement of basal forebrain and associated structures. Salmond CH, Chatfield DA, Menon DK, Pickard JD, Sahakian BJ. Brain. 2005;128:189-200. Neural correlates of impaired performance in a working memory task in survivors of traumatic brain injury. Kasahara M, Menon D, Salmond C, Outtrim J, Taylor Tavares J, Carpenter T, Sahakian B, Stamatakis. Journal of Neurotrauma 2009;26:A-68.